The revised Common Rule goes into effect on January 21! As of that date, the eResearch system changes made in 2018 to support the HRPP Flexibility Initiative will apply to all studies regardless of funding source. Continuing Review - No longer required for some minimal risk research, including studies where the only remaining activity is the analysis of identifiable data/biospecimens or activity to obtain follow-up clinical data. For details, see the U-M Implementation: Continuing Review webpage. Exemptions - New categories and clarification of existing categories. Some exemptions may require "limited IRB review" (similar to an expedited review process), while others may qualify for "self-determination." For details, see the U-M Implementation: Exemption Changes webpage. Informed Consent - A new "Key Elements" section and a rearrangement of content is designed to facilitate a potential subject's decision to participate or not. For details, see the U-M Implementation: Informed Consent webpage. Single IRB-of-Record (sIRB) - IRB oversight for most federally-funded collaborative research projects located in the U.S. will be required to use a single IRB (commercial, academic, or hospital-based) starting January 20, 2020. 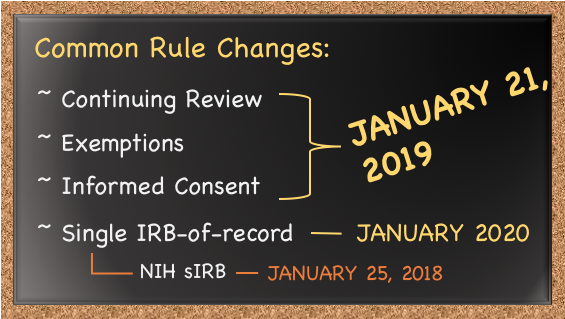 See Other Regulatory Changes for information about the NIH sIRB policy implementation, as well as other recent NIH policies related to clinical trials. The new regulations do not impact studies approved prior to the proposed implementation date of January 21, 2019. For existing studies, after the U-M implementation date the U-M IRBs may choose to apply the new rules to minimize burden for investigators. The U-M Human Research Protections Program (HRPP), the four U-M IRB Offices, and ITS eResearch teams are working collectively to interpret the new Common Rule elements and update the University's policies, business processes, and eResearch systems to accommodate the changes while maintaining a high-level of subject protection. The working groups will present their proposed business process changes to U-M's IRB Council, the advisory/governing body for the HRPP, in July 2017. Once approved, these teams will seek feedback from the research community and work on implementation plans so that U-M is prepared to follow the revised Common Rule by the finalized effective date. Exemptions - U-M plans to pursue options for self-determination for some exemption categories. As this is a big change to current University practice, a post-approval audit period may be implemented to evaluate the effectiveness and limit potential risk. By adopting this optional element of the Common Rule, the HRPP believes that U-M can demonstrate administrative flexibility and be a leader among its peer institutions. sIRB - U-M IRBs will continue to assess its criteria for whether U-M will serve as the single IRB-of-Record or cede review to another institution or a commercial IRB. Broad Consent - U-M will not implement the new regulatory "Broad Consent" option as an informed consent process at this time. Exemptions 7 & 8, which rely on Broad Consent, also will not be implemented. Check this website periodically for new information. We will continue to add information through January 2018, as it becomes available. Look for educational sessions, such as IRBMED's seminar series, advertised here, in newsletters, and on the HRPP and IRB websites. Go to the U-M Implementation: NIH Single IRB-of-Record (sIRB) webpage for more information. NIH's definition of a clinical trial is broad, encompassing a wide range of activity which now may include behavioral studies (e.g., studies that manipulate an independent variable to observe a hypothesized modification of a behavioral process). For an overview of the changes, view the NIH Clinical Trials Requirements presentation from IRB-HSBS. 03/22/2018: The federal appropriations act (p. 34-35) directs NIH to delay enforcement of its expanded clinical trial definition (shown above) for the federal fiscal year 2018 (October 1, 2017 - September 30, 2018) and to seek comments from the research community regarding NIH's expanded interpretation of "intervention" for fundamental research projects involving human subjects. Note: The law only impacts NIH's policy that revised the definition of clinical trials. All other recent NIH clinical trial policies, including the use of a single IRB-of-Record when applicable, remain in effect. 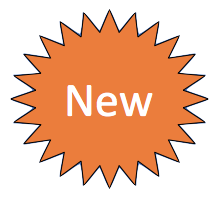 IRBMED: Changes to the Common Rule Link to IRBMED's Seminar Series webpage containing two presentations explaining the changes to the 2018 Common Rule. The presentations differ in content based on information known as of the presentation date. "What do revised U.S. Rules mean for human research?"